His work demonstrates great self-assuredness in which the text plays a is leading role, whether from the titles of his pieces or as part of the work itself. Yornel Martínez has discovered that this process is very closely related to the dynamics of his being. He has acquired a solid documentary knowledge that has given him an edifying obsession, firmly focused on the route of visual poetry which has the characteristic fragmentation of intellectual phenomena that reach our Island. Precisely this spirit of stimulating the interpretive freedom in each phase of creation is like his vital voice in his processes, the nature of events prepared to cause multiple reactions and to stamp a new mark on everything that constantly traverses the path of sedimentation. In his trajectory there are works focusing on personal destiny, specifically to be enjoyed in solitude, especially because their contents tend to unleash singularities. Other works refers to group experiences since their success depend on a public that is ready and willing to interact with the exhibited object. The pieces called Equilibrio and Exergo are a significant demonstration of this. Equilibrio deals with a rectangular table that is suspended at the center, balanced, at a height of 120 cm. The table is set with a dinner that follows the classification of foods and their constitution in the manner of the Chinese philosophy of Yin and Yang. Yin foods are at one side of the table and Yang foods are on the other side, thereby creating a play between the physical balance of the table and the objects distributed on it, and the energy balance of the food. A tension field occurs when people begin removing food items, something that has to happen equally on the Yin and Yang sides. Otherwise imbalance occurs and chaos ensues. Exergo is a work in progress. It is an intervention carried out on the marquee of the Payret movie theater, consisting of subverting the announcement for the film being shown and replacing it with a verse or poetic image with the name of the author. At this time, a verse from the poem La isla en peso by Virgilio Piñera was used. It says: “Light begins to give birth to light”. In itself the work has two fields of action: one is associated with the immediate effect that is being caused in a public space and the other is related to the power of the text being used, generating ample possibilities for reflection. I think that the principle element that makes Yornel’s work fascinating is the risk factor he uses as accompaniment. 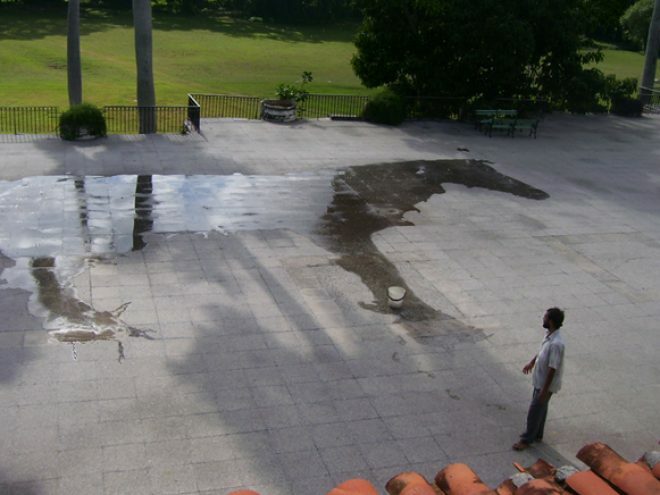 His work called Caballo de la pradera is just such a piece: on a granite floor a wet sponge creates the drawing of a horse and inside the body of the horse we see the reflection of a landscape background. This is a strong metaphor that uses its ephemeral but striking nature to manipulate the conceptual strength of a symbol. His painting confirms some aspects that are very visible in the rest of his work but from very unique esthetical positions that are constantly being supported by the power of the text. Thus, we are surprised by canvases such as M. Heidegger mirando el reloj, Caballito de mar que tiene visiones, Visionario que llora soles, Paciente garabato, El cumpleaños del elefante, Mariposa aplastada por astro and Cada paso hacia el horizonte es un templo en la nieve. Yornel’s most recent obsession seems to be the alternative magazine P350.On this subject he has said: “P350 is basically a support medium. It is the package which cement comes in, paper bags that have the words Portland P350 stamped on them. Normally, when we use the cement in Cuba, we throw the paper bag away. We have begun recycling these bags and using them as a support for a blog. We call it a magazine but I prefer to calli it a creative blog. When I say we, I’m including Omar Pérez and Amílkar Feria. We three were the first ones to start working regularly on the project. Later on other people joined us”. Work such as this opens up new spaces and serves as feedback to controversy and that’s exactly what this magazine has been doing. At the same time, it is depositing a significant amount of energy and knowledge onto circumstances where these can be shared and discussed by a large number of people.